These are fantastic, what a breath of fresh air after the tired old designs they recycled this year for the main set. I predict a great deal of disappointment from the public when they go to buy their customary booklets of 12 x 2nd class and find that they are not getting these, but the dreary looking ones that look so much like those issued in 2005, 2009 and 2011. Perhaps it might have been better to have done this in good time so that booklets could have been issued rather than just sheet stamps. But all that said, congratulations to the two girls who must have very proud parents right about now! Ian, will these have an offical first day of issue of 5th November? 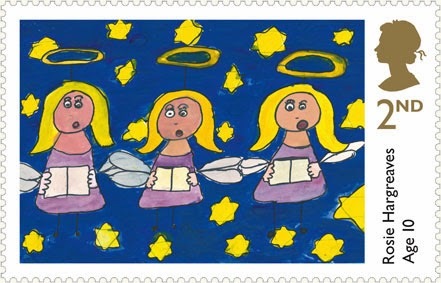 Just thinking about First Day Covers as the Christmas Isasue FDCs from Tallents House don't appear to include these two stamps .... presumably we need to make these ourselves?? Thanks for the nudge. I have now updated the blog contents having confirmed the position with Tallents House. In short they do HAVE FDCs but you have to order them separately. If you want other special handstamps, you'll have to find blank FDCs at POs or from TH. Not sure if Post Offices know about this issue. 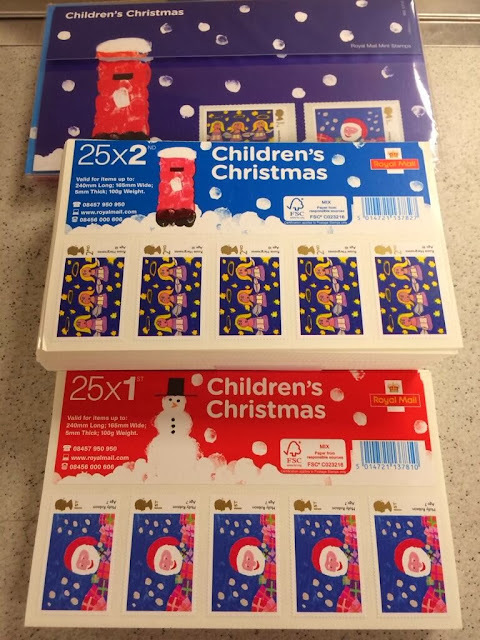 Told by Harlow Post Office today that they have the normal Christmas stamps ready to issue next week but didn't know anything about the Children's Competition issue. (Good job I had printed illustrations from your web site!) I also asked whether they will be putting the "Robin" Post & Go labels in the machine. Machine actually out of order and being 'worked on' (which appears normal each time I go there) but to date they have not received any stock of Robin labels. I think they've been told to put Robins back into the machines if they have last year's stock left, and if not then order some more. I'll pass this on. My PO didn't have the competition entry stamps at 11.30 - maybe on Monday. I like your little typo in the second sentence "...HRH The 'Price' of Wales. The stamps will be on sale from November 5th." Could be quite expensive this year! Darned 'Copy and Paste' - can't rely on professional PR agencies now. There's no mention of sheets of 25 stamps on the Royal Mail Web site. Will these be available to order as a specific product, or do you just order in multiples of 25 stamps to get a sheet? We weren't told until Friday that the format was sheets of 25, and then only because I asked. I've got a feeling that those sheets of 25 Children's stamps may well be worth quite a bit in a few year's time. And if they're not, you can always just use the stamps at face value. For the first hour of trading, staff refused to sell single Children's Stamps. One had to purchase a complete sheet of 25 or buy a Presentation Pack to get singles for a FDC. Eventually sense prevailed after 2 phone calls. Staff had not been sent any instructions on how these stamps could be sold. Well at least they had some at Trafalgar, I tried 2 POs in Nuneaton today and they had none! The main PO said they might have some Friday!. Why the heck cant the Bureau send them to customers with standing orders; I didnt even know they existed till I looked at your web site. The first 2 offices I tried refused to sell the stamps individually, the third (one of the Post Offices retail partners) said they only came in the presentation pack. The fourth office I tried, one of the old fashioned sub post offices where I normally get my new issues and books from, had them and were happy to sell whatever I wanted, even the Generic Sheet. Can’t wait for the sub postmaster to come back from his holiday, his relief staff are ok, but do like to scribble (could be numbering its hard to tell) on booklets and sheets. The scribbling on booklets and stamp sheets (Self adhesive) by Postal Staff, seems to becoming more prevalent. Their excuse is, to keep tally of what they have left at the end of the day. The number of times this year I've made a decision to purchase stamps, only to find scribbled sums on the back of sheets or numbers written on the front of booklets runs into double figures. They still try to sell them to you, and can't understand what they have done wrong. It's not actually new - happens on business sheets, some booklets, and on the piece of paper paper-clipped to the small pile of miniature sheets !!! Why aren't RM including these in standing orders? If I have collected every single presentation pack ever issued why would they think I wouldn't want this one? It's not like £1.60 is going to break the bank after the monster expense of the rest of the year. Some times I think their random and inconsistent behaviour is deliberately intended to annoy us. 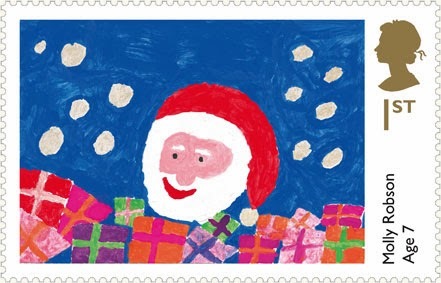 I've received a 'business' mailing from Royal Mail about Christmas stamps, with an order form that includes the Children's Competition designs in sheets of 36, not 25! Do these really exist, or is it a case of an orginal plan for sheets of 36 being changed to 25, and the form not being amended? I suppose I could try to order some and find out!